What is the first image that comes into your head when you think about Little Red Riding Hood? Most likely the cape, followed perhaps by the basket, the woods and the wolf. For me, creating character starts with visual elements. In our musical, Little Red Riding Hood’s crimson cape is one of four items that the Baker and the Baker’s Wife must collect in order to reverse a spell that The Witch has cast upon them years ago. This week, we started the process of costume fittings. Our costumer, Mira Steinbrecher, has pulled pieces for each character. There are three racks filled with potential costumes, sorted by large plastic tags. These tags are used for each production, and have painters tape on each side: the front-facing side has the character name, and the back side has the actor name. Costume pieces are pulled, borrowed, or built. Pieces that are “pulled” come from WICA’s costume loft, which holds hundreds, if not thousands of pieces, organized by clothing type, color and time period. Pieces that are borrowed (or rented) come from local theatres. Pieces that are built are constructed using fabric or taking apart existing costumes and repurposing them. The costumer looks at the costume plot, often provided in the script of a given play. A costume plot details how many costumes each character has over the course of the play. In our show, Little Red has one base costume, on top of which two different capes get placed. Our production has a traditional aesthetic, in that each of the fairy tales is costumed from the era in which it originally takes place. Little Red’s inspiration was pulled from the era of Heidi, with an Alpine flair. The base costume is a navy blue dirndl with red embroidered flowers, a vintage piece borrowed from Studio East in Kirkland. The first cape is the iconic red one with a hood. 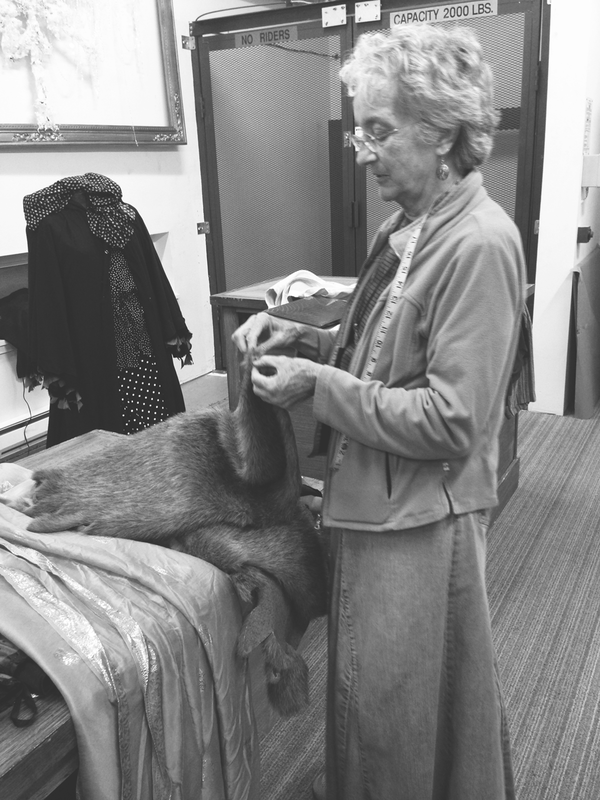 Mira pulled a beautiful vintage wool cape donated to WICA that was originally from Saks 5th Avenue. Costumes must be adjusted for function as well as their visual appeal. In our show, the Baker temporarily steals Little Red’s cape off her shoulders, so Mira will modify it to have a front clasp that easily comes apart. The second cape is made from the skin of the wolf. Little Red proudly proclaims to Jack: “My granny made it for me from a wolf that attacked us. And I got to skin the animal—and best of all, she gave me this beautiful knife for protection.” Mira is crafting the wolf cape from a piece originally used in Gaielle Remembering. In addition to the dirndl and the capes, Mira has built a red and white mop hat with red lace trim, for comedic effect as well as to age down the appearance of a 29 year old actress playing a 14 year old character. Mira then secures pins to create new hems for petticoats and mark spots to later place fasteners, etc. In the five weeks between now and production, Mira and her crew of volunteers will finish costumes for the other 24 actors in the production. Mira reminds me to let my readers know that there is always room for volunteer stitchers and wardrobe/dresser folks for the run of the show! If you’d like to be part of the magic, you can email Mira: MiraJean@whidbey.com.